It wasn’t long ago when organizations asked themselves if they actually needed a social media presence. Nowadays, most businesses have at least considered gathering a social media team or at the minimum, finding the right social media management tool. Being present on social media is still a back-burner idea for a lot of companies. This results in several brands sending Tweets, Instagram images or Facebook posts to the wrong audience or in a way that cannot be tracked. You have to consider whether or not your social media strategy can be analyzed and who has the skills to do it? No matter what the size of the business, it can be daunting to consider the funding, resources and time needed to create a social media team. 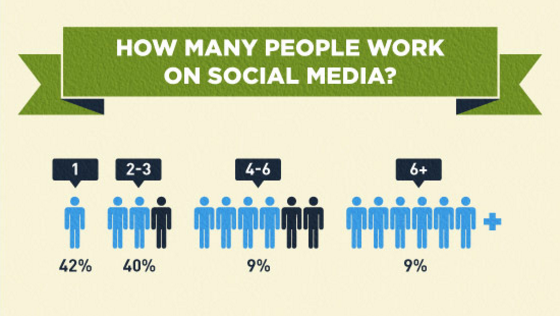 In fact, a Go-Gulf infographic showed the majority of social media teams are fewer than four people. On the other hand, you still need the personnel to properly manage all social media channels across the entire business. Don’t look at social media as side project, but instead, as a major commitment to your marketing strategy. Social media has the ability to unlock doors to new audiences and give you a truly unique way to engage with those talking about your brand. Companies have always tried to successfully reach younger demographics, and with 90% of those between the ages 18 and 29 on social media, it’s the perfect place for your brand to build deeper relationships. Sprout’s social media management platform makes it seamless to bring large, multi-disciplinary social teams together across content creation and distribution, customer care and measurement initiatives. Additionally, here are some keys to building a dynamic social media team. What social media tools will be used? How can we measure our efforts? What’s the purpose of your social media channels? These questions should definitely be answered as you build your team, but it’s important to know the overall purpose. Will your social media channels be used to drive engagement? Answer customer support issues? Reach new audiences? Demonstrate a successful ROI? All of these questions are valid to businesses, but you should ultimately know why you’re taking on social media in the first place. Once you know your path, putting the pieces together will be much easier. Before you start building your team, it’s necessary to plan our your team structure. This will give you a better outline of who to hire, where to place positions and to see who leads the pack. According to a survey conducted by Altimeter, corporate social media teams have on average 11 members. This includes businesses with more than 1,000 employees. If you’re going to or already publish content, you’ll want see if those writers, SEO specialists and other content creators could be a part of your social outreach. Content marketing strategies are critical to your business and having those members work with social media engagement could be a huge success. Content creators are important parts of your social team because they can use social media outlets to make quick, fun and engaging posts like Lagunitas Brewing Company. It might not seem like much, but thousands of eyes are on your brand in these channels. It’s important to have community managers intertwined with certain social media roles because they can keep calm in even the most hostile situations. Twitter trolls are everywhere, and you need to have someone who has the patience for them. Your company should do what it can to resolve issues and through social media, you have the opportunity to make customers feel like their voices are heard. You should consistently look for ways to expand your brand and social media is a great tool to do so. Use your PR talent to reach out to those on social media to build relationships with not only customers but other businesses as well. Once you start putting the puzzle pieces together, your team will have more of a backbone. Try to organize these sections based on business and education as well as marketing and communication management. Product experts: When social media team members know everything about your products, they can easily answer or send questions to the right people. Your team should know how to answer questions quickly or be able to find someone who can. How the internal business operates: While it’s important to know where to send questions, it’s also essential to know all the ins and outs of the company. This can include collaboration with your marketing, sales or even human resources team. Updated on social trends and news: Your social media manager should be abreast of all the newest platforms, tools, news and trends going on in the industry or else he or she could be behind the times. Each year the industry changes and your team should be one step ahead on how to implement something new into the process. Customer service enthusiasts: As social media becomes more widely used as a customer service tool, you have to be ready to answer questions and have the drive to help customers. Make sure your team is ready to tackle any customer support issue and that they feel confident posting any content to world on social media. Team members have to have a balance of being witty and what’s appropriate for the company. Brand advocates: Your social team should be full of brand advocates that want to fully represent the company. When you hire those who want to be a face for the company, you’ll get social media team members that take the time to know the ins and outs of the company as well as the social space. Data-driven thinkers: Every social media team needs members that can go through the numbers and the statistics to measure ROI and performance. Almost 80% of businesses plan to incorporate social media data into their marketing campaigns in the near future. This means data and social media analytics has to be incorporated into your team building strategy. This will get everyone on the same page with social media data and statistics. Now that you know what qualities and characteristics to look for when building a social media team, you should also figure out where you’re going to post content. There are several social media networks out there, but you need to find the channels that will work best for you. More than likely, you’ll have multiple networks and possibly numerous profiles on each social media channel. Even though it might seem like having more members of the team would a better idea to manage multiple accounts, you still run into problems like message approval, collaboration tasks and maintaining your brand voice through each channel. Here’s where social media management tools like Sprout Social come into play. With Sprout, you can work more efficiently as a team to get things done. 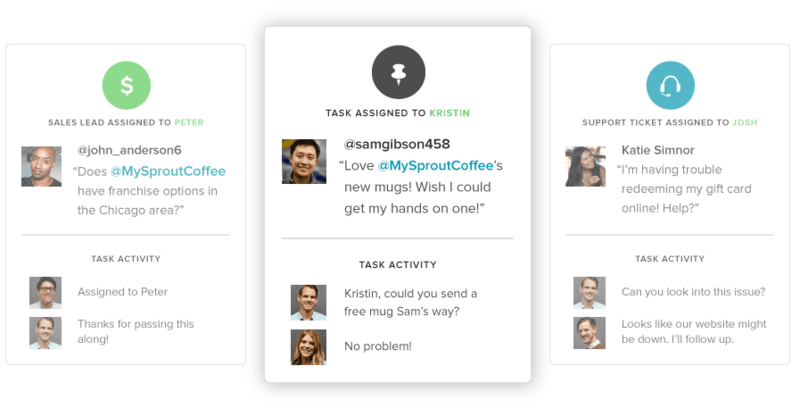 Through a single-stream platform, you’re able to assign tasks to different teams like customer support or sales. On the other hand, if your social media team is limited, you don’t want your employees to waste time logging in and out of each network. Instead, your team can manage all profiles together across major platforms like Instagram, Facebook, LinkedIn and Twitter in with a single Smart Inbox. Try Sprout Social for free by signing up for a 30-day trial! Figuring out who will be in charge of what network or responsibilities is never an easy task when putting a team together. Social media trends, habits and etiquettes change for each network, so try to get your members who are interested in a specific channel to focus on maximizing efficiency in that space. If you have members who aren’t interested in LinkedIn, don’t assign them content publishing for that network. Let your team help you decide where they would be the best fit. As an organization, team collaboration should be instilled in every operation to be as efficient as possible. With Sprout, you have collision detection notifications that keep you from taking on a task someone is already working in. Anyone on a social media team will tell you time is precious, so avoid double entry work so tasks are streamlined. When you’re running a social media campaign, it’s a good idea to tag all incoming posts so everyone stays organized with messages. Messaging tagging tools can keep you from bumping heads with team members and it prevents lost messages, which could be detrimental to your followers. Everyone knows the social media world is unruly, but that doesn’t mean you should ever be complacent. Make sure you’re always looking for ways to improve the team, whether it’s through data-driven decisions or social listening strategies. Successful social media teams are those who have a pulse to the industry and always have an ear to the ground. When the team can stay ahead with helpful reports, you’ll be able to see each area you could improve and the spots where you’re excelling. Social media teams can face multiple challenges when everyone is working on the same network or profile. However, there are ways to work together without stepping on each others’ toes. Successful teams should always be thinking together, which ultimately will lead to better content production. If we missed something in our social media team guide that you think is really important, shoot us a comment below!